L.S. Grim Consulting Engineers was responsible for all electrical issues associated with the design of the Rover Project for the AVIS car rental facility at Regan National Airport. 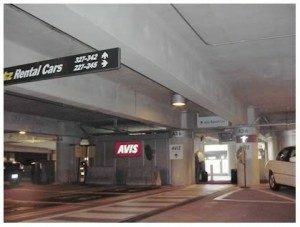 We have also provided similar design services at BWI Airport for an AVIS Rover facility at that parking garage. The project consists of a power wiring and radio communication equipment to allow the AVIS Car Rental Company to manage the location and identity of all their cars which are parked in the garage. The work entails power wiring with conduit at home runs, various isolated grounds and dedicated circuits, fiber optic cable and some telecommunications gear for the tracking of the automobiles. L.S. Grim was responsible for all the design work associated with Rover Project.